Tony "Lip" Vallelonga, Viggo Mortensen (right), and renowned classical pianist Don Shirley, Mahershala Ali. Yes, it's a bit Driving Miss Daisy in reverse, but Green Book also has more than a hint of Planes, Trains and Automobiles to it. Which is perhaps not terribly unexpected: This is the (mostly) dramatic debut of director Peter Farrelly, one half of the notorious Farrelly Brothers, who brought us such gross-outs as Dumb and Dumber and There's Something About Mary. Thank goodness he eschews the disgusting and the sophomoric this time and sticks to humor that is warm, sympathetic and humane. 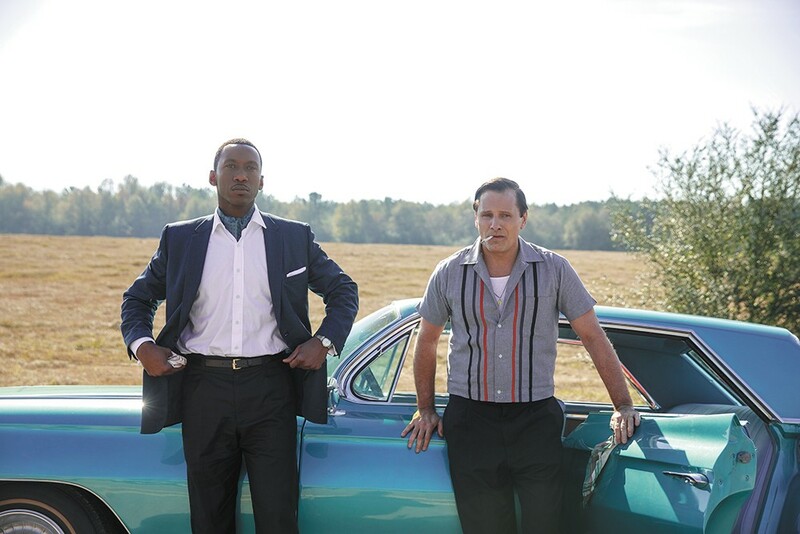 There's plenty funny in Green Book, but it is all in the service of compassion and empathy. So — New York, 1962. Temporarily laid-off nightclub bouncer Tony "Lip" Vallelonga (Viggo Mortensen) needs a job, so he agrees to drive renowned classical pianist Don Shirley (Mahershala Ali) around the Deep South on a six-week performance tour. It's never really clear if Don doesn't know how to drive or merely doesn't like to drive, but Don is a diva and Don gets what he wants, and also having some white muscle on the trip is probably a good idea, for Don is a black man, and the 1960s American South is bad news. Tony anticipates trouble, and it will all get worse than Tony could have imagined. They haven't even left New York before Tony, who is not the most progressive white man to be found in the 1960s, is nevertheless sort of appalled to discover that they will need to refer to the so-called Green Book, a travel guide to the South for African-Americans, to help them find restaurants and motels that will welcome them. Or that will welcome Don, at least. Tony will be able to stay wherever he likes. And yes, Green Book is yet another tale of American racism told primarily through the eyes of a white person discovering just how terrible racism can be, and discovering that black people are human and worthy of respect. But what snatches the film from condescending awfulness is the wit and the charm and the complexity with which both Don and Tony are drawn, and the absolutely gorgeous performances by its stars. As Tony, Mortensen is all big, expansive movement and even bigger brashness, a man who wears his heart — warts and all — proudly on his sleeve, just don't ask him to actually talk about his feelings too much. (Mortensen captures with perfection working-class Bronx Italian attitudes, postures and accent.) As Don, Ali is all tiny, precise actions, carefully chosen words, and a deep emotional reserve. Don is intellectual; Tony is visceral. Don is still; Tony is... not. Tony is gusto; Don is elegance. They are a true odd couple, and the hard-won common ground they find over the course of their trip is as much about personality as it is about race. And while Tony gets his consciousness expanded a little as he learns what the world is like for a man like Don because of the color of his skin, both men learn about each other, and their very distinct methods of approaching life, in ways that go well beyond that. Don's experience of racism also comes with another uncomfortable angle: If being true to himself means playing the classical music of white composers, and moving easily in upscale white society, does that make him not "black enough"? So the film's exploration of the pain and the dehumanization that racism causes comes with some extra nuance. This is a true story. Along with Farrelly and Brian Hayes Currie, the script is by the real Tony's son, Nick Vallelonga, who has long been an actor and screenwriter. (I don't know if this is the case, but one can imagine him telling anyone in the industry who would listen that his dad's story would make a great movie.) The period authenticity that Farrelly hews to is terrific: The film opens with Tony working as a bouncer at the Copacabana nightclub, and I fully expected to see Henry "Goodfellas" Hill on his fancy date with Karen in the background. The original print version of this article was headlined "Changing Lanes"